With booming sales, award winning lift manufacturer Aritco needed to expand their storage capability. One of the problems they had was that articles stood on the floor as bulk storage, with restricted visibility and access. It was very difficult when they needed to pick what was standing at the back. They turned to Constructor Sweden to help them devise the perfect storage solution not only for their lifts, each of which weigh 1.1 tons, but also the additional frame which is 500kg, and the curve which is 600kg. The Constructor team spent time with the client reviewing the very specific requirements that such heavy items demand. A number of storage methods were looked at during study visits where they saw how the different methods work in everyday life. Having looked at Fist-in, First-out (FIFO) and satellite, Aritco selected Push-back racking as it offered additional benefits such as; saving a truck aisle and giving them more pallet places. Push-back racking is particularly suitable for bulk goods that can be stored on pallets according to the First-in, Last-out (FILO) principle. Here, special channels with wheel conveyors sloping at around 4% are integrated into one sub-frame of the P90 Racking system. One after another, up to ten pallets can be pushed into these channels and once a pallet is pulled out, the rest rolls out automatically. Constructor created a custom-made option for Aritco and now completed lifts are stored on specially commissioned 1200 x 2400mm pallets. The lift is carefully placed onto the pallet so that it remains within the outer edges - thus avoiding damage to the coated parts during storage. The pallet is then placed by the truck onto a cart in the rack section. Each section contains three pallet positions in depth, two on carts pushed back as they are filled, and the last cart is standing right onto the beam level. A special 3-beam solution with an additional beam to support the heavy pallet means that the load is distributed evenly. A back mesh has been mounted on the upper locations to prevent the pallet being accidently pushed from the pallet rack. "We are very pleased with this solution for our finished goods. It is a perfect match for our needs and requirements, and we have received excellent support and assistance from Constructor. Another big advantage is that we are covered in terms of storage capacity for years to come. 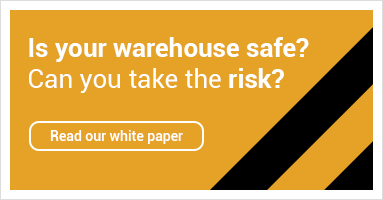 With a company growing rapidly, it is important that we do not need to extend the warehouse yet again. Right now we produce 2,750 lifts a year, and we have storage capacity for 4,000." - Fredric Gülich Warehouse Manager. Aritco is an award winning manufacturer of platform lifts and home lifts. With approximately 90 employees and sales of around SEK 300 million, Aritco supplies lifts for both public and private market all over the world. Through its network of more than 140 distributors, Aritco has installed more than 25000 lifts in over 40 countries.